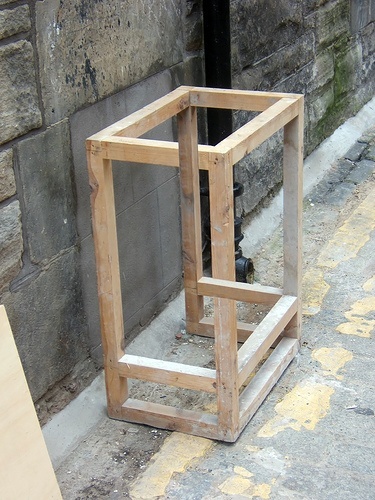 This ridiculous object was snapped outside a bar by Simon Scott, its another take on the well known "impossible triangle" illusion but which uses a bit of creativity to create a wooden box shape. Is this object a genuine illusion made up of seperate pieces viewed from a certain angle or is there some Photoshop involved ? Actually, it's quite possible. All you have to do is cut a piece of wood out of the bars that look like they're being overlapped. If you can do it correctly, it'll look like this at one angle. i don't see anything and we are not ''damn people'' mj we are not like you. angel is right some of the bars were cut so shut up and think u damn people!!!!!!! !